Know how to use a DIP IC, e.g. from tutorial 17 – Electronic Dice. Read about seven segment displays. Find more information about interfacing the 74HC595 IC to the Arduino in the Serial to Parallel Shifting-Out with a 74HC595 article from the Arduino website. The circuit diagram uses the same Arduino pins as this article and the switch is wired the same as the Arduino Button example. The completed breadboard circuit is shown here. Click the picture for a bigger image. Insert the 74HC595 IC into the breadboard and hook up its power and ground pins to the top and bottom breadboard rails. Insert and wire up capacitor C1 (100n). Insert the 470 ohm resistors. Wire the resistors to the 7-segment display. Wire the resistors to the 74HC595 IC. Wire pin 10 of the IC to 5V. 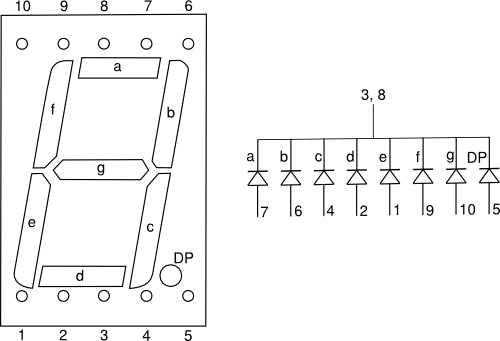 Wire pin 13 of the IC to GND. Connect the push button switch and R9. Wire the switch to the Arduino. 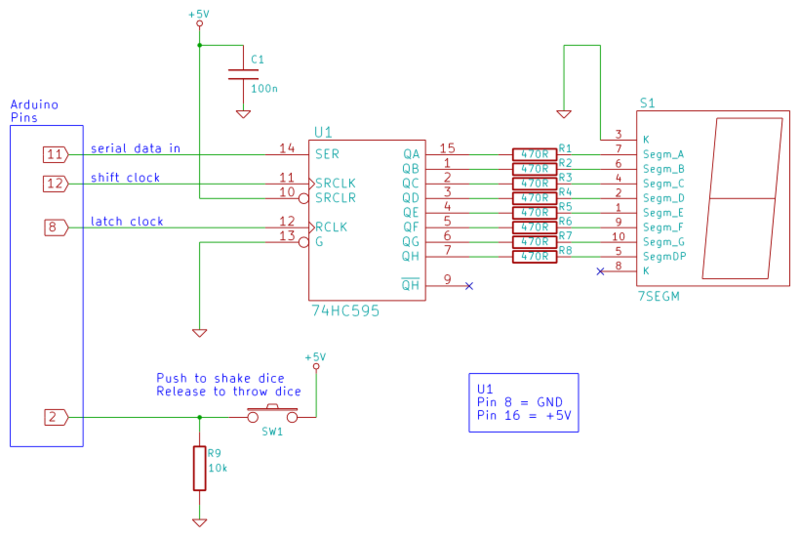 Download the Arduino_Dice sketch and load it to the Arduino. Press and hold the push button to shake the dice. Release the button to throw the dice. After the dice settles, the number that was thrown will be displayed.